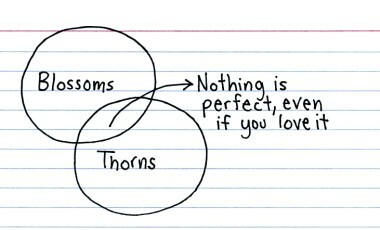 Jessica Hagy from Indexed has possibly captured the reason for 50% of all marriages ending in divorce – Perfection. Or at least the illusion that one person can perfectly fill every need and if he isn’t perfect when you marry him, you can expect him to become perfect and meeting all your needs. Perfection is a perception that is achievable. Working hard every day to live happily ever after is within reach but pedestals shouldn’t be part of matrimony. Relationships thrive in observing flaws and faults and either accepting them or openly talking about them. Asking someone to give up a part of them self or change a value or feature that isn’t hurtful to others opens a door to resentment by both parties. Love your partner. Love them as they are. Celebrate when they celebrate, grieve when they grieve. Tell them why their health is important to you. Let them know that something they are doing is hurtful to you. But love them petals, thorns, scent and roots. Anything that can help heal a marriage is wonderful. There is nothing better than growing together in love over the years, and having your partner that understands you inside and out.